I have had an on/off relationship with the Victorian gardens at Killerton in Devon for almost 20 years. Its close proximity to the M5 makes it a great staging post on the long trek to Cornwall, so I have often stopped to stretch my legs in this lovely spot. A National Trust property, the garden is principally the creation of the Aclands, one of Devon’s oldest families. They employed John Veitch, the famous Exeter nurseryman, to plant the extensive grounds. Consequently the hilly woodland surrounding the house is packed with rare and unusual trees and shrubs. Another speciality of Killerton are tender perennials, which enjoy the mild Devon climate and are grown close to the house. Killerton is not a formal or especially finely structured garden and what formality there is, is close to the eighteenth century house. The huge herbaceous borders run parallel to the long terrace and have recently been renovated. The idea was to re-instate an earlier planting scheme by Graham Stuart Thomas (Head Gardener back in 1962) and much of the planting was completed early this year. The result is a little bit brash, especially in the hotter sections, but it’s early days for the 2,200 new plants. A small parterre was designed by William Robinson, known best for his love of wild gardens, thus making it something of a curiosity. 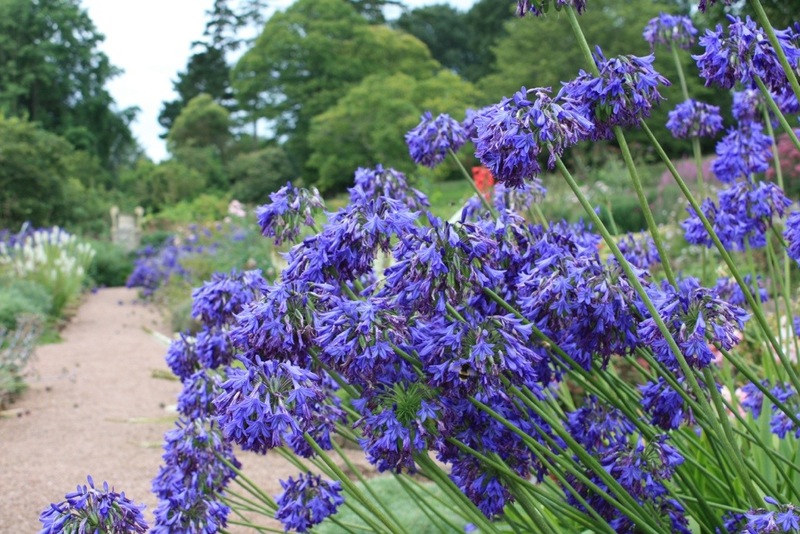 Agapanthus are a speciality and I particularly admired a very tall, elegant variety called “Loch Hope” which was just coming into flower at the end of August. I couldn’t find a name for the variety below, but it had literally hundreds of flower heads in the most vivid cobalt blue. 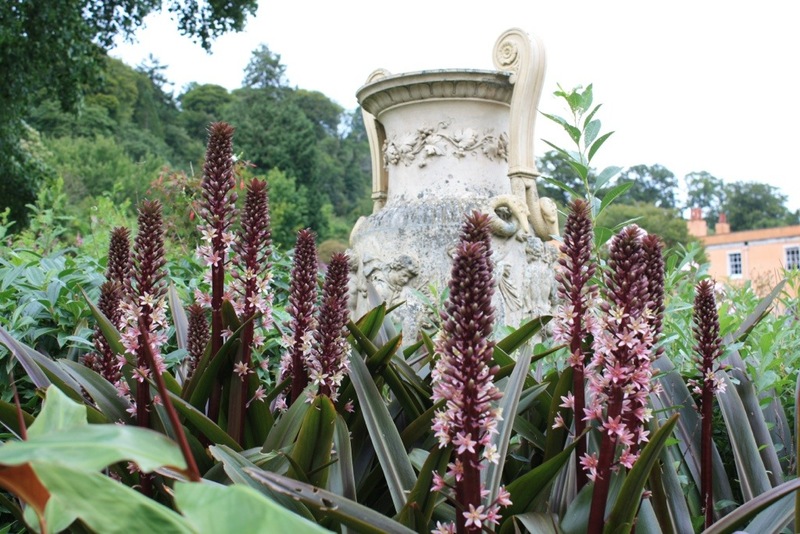 The absolute star of the show in the parterre was Eucomis comosa “Sparkling Burgundy”, a statuesque bulbous plant which provided the perfect foil for a huge Coade stone urn (see top). The highlight for me on this visit was the rock garden. From previous visits I remember this as a slightly dull and overgrown part of the garden, tucked behind a rustic summerhouse called the Bear’s Hut. 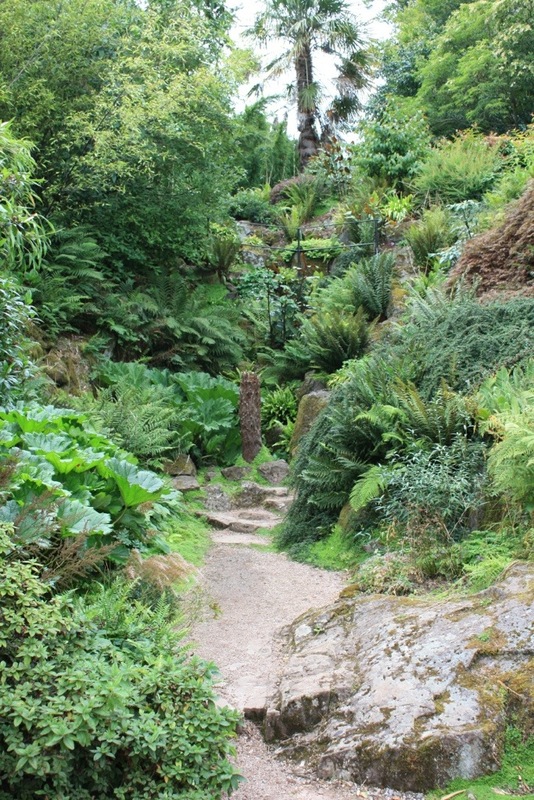 Following four years of renovation it is overgrown no more, and is once again neatly laid out with winding paths and steep rock banks clothed in well tended plants. Having researched the original Edwardian alpine planting of 1905, the gardeners at Killerton concluded that it would be too labour intensive to restore it back to how it was in its heyday. Instead they have chosen to replant mainly with Himalayan species, including a few extras from China and Japan. Among many notable plants was a huge specimen of Kirengshoma palmata, a Japanese native, which was dripping with primrose yellow bells. It was fun watching the bees work out how to get inside these long flowers, which never seem to open fully and give them free passage. Nearby were large clumps of Rodgersia and deep red Polygonatum. Almost untouched by slugs and snails a group of lush-looking hostas grew on the side of the little stream which cascades down the rocks, their roots directly in the running water. 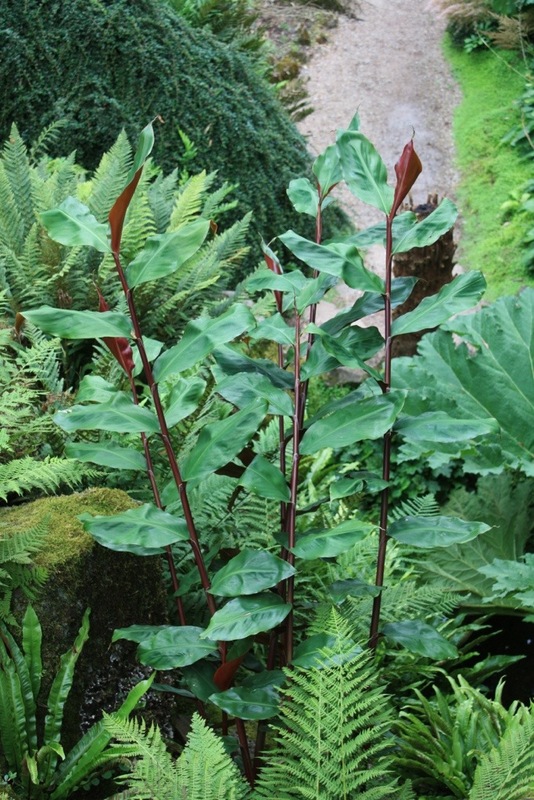 On the steeper slopes, long spears of Hedychium greenii (above) emerged from between the rocks. This showy but tender ginger lily has wonderful marroon stems and glossy green leaves. It flowers a little bit later than other Hedychium, but its large orangey-red flowers are well worth the wait. 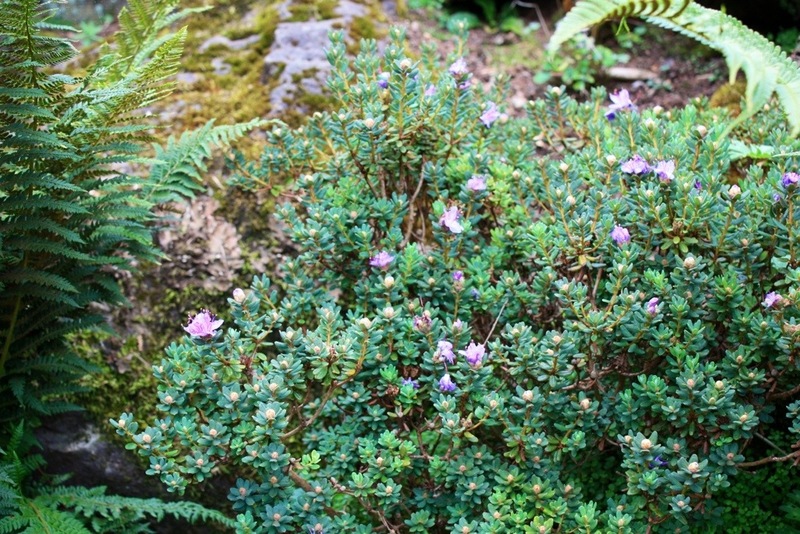 If you looked closely, tiny rhododendrons were just starting to show their miniature purple flowers. 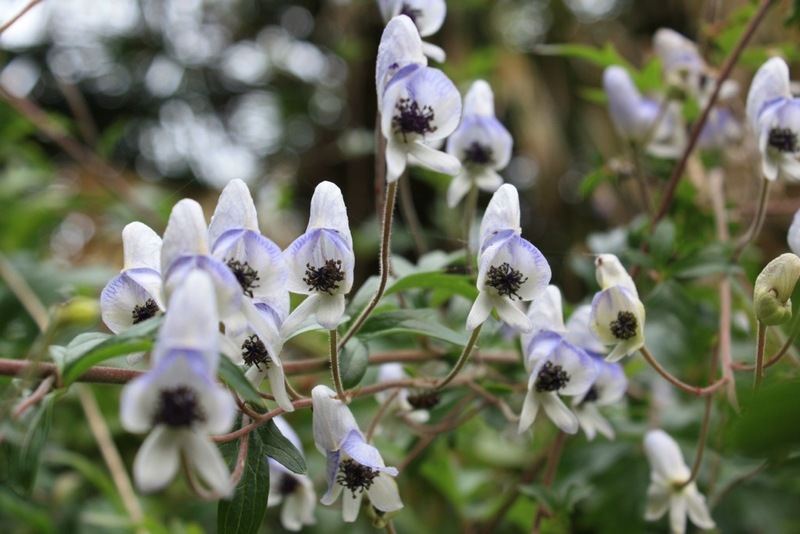 Almost at the top, above the entrance to an ice house built in 1808, grew a beautiful Aconitum (Monk’s Hood), its long trailing stems covered in rows of bicolored flowers. If anyone knows what species this is, then please let me know. It looks like it could be a variety of Aconitum cammarum, but what a graceful, delicate plant for a lightly shaded spot. There at the summit of the rock garden, with towering trees and views across Devon, you could almost convince yourself of being somewhere wild. Following the path over an iron bridge, handsome clumps of Bamboo accentuated the height of the slopes, growing amongst established palms. The effect of the whole, surrounded by native woodland, feels very authentic and a world away from the straight lines of the terrace below. Passing by the Bear’s Hut on the way out, the fruit was ripening on a lovely old mulberry tree. I harvested a few and got back to the car with my hands stained dark red. The National Trust seem to buy in a lot of nursery stock these days; this is a pity as the choice does not always reflect what’s growing in the garden. 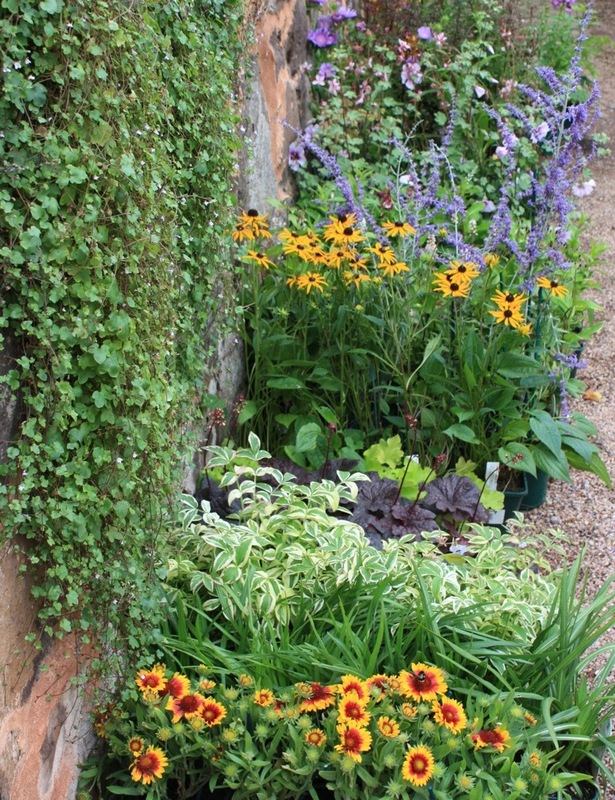 However, Killerton has a really good plant centre with a mix of home grown and bought in stock, so make sure you have space in your car for a few acquisitions.